Directions: First graders will roll the dice and read the row of words, working toward fluency. 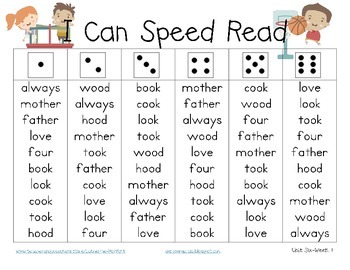 Students can use this chart independently but a partner will check for accuracy and be a great cheerleader! 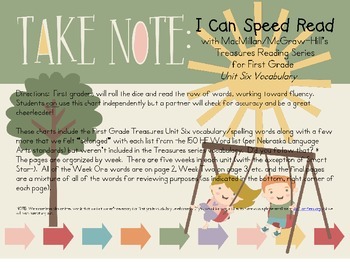 These charts feature the First Grade Treasures Unit Six vocabulary/spelling words along with a few more that we felt “belonged” with each list from the 150 HF Word list (per Nebraska Language Arts standards) but weren’t included in the Treasures series vocabulary. The pages are organized by week. 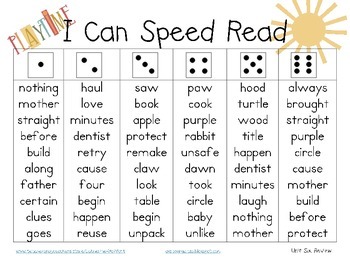 There are five weeks in each unit (with the exception of Smart Start). All of the Week One words are on page 2, Week Two on page 3, etc. and the final pages are mixture of all of the words for reviewing purposes (as indicated in the bottom, right corner of each page). Check out my store for Smart Start, Unit One, Unit Two,and Unit Three, Unit Four, and Unit Five editions. Note: Vocabulary/spelling words vary by state and version. If you would like additional/different words, please message me for a custom order. Thanks! IMPORTANT: Don't open the file by clicking on it (as this will automatically open it with Preview). Instead, launch Adobe Reader then go to 'File'-->'Open...', and select the PDF that way.